Monkeypod, Monkey Pod (Samanea saman, Albizia saman, Pithecellobium saman) color tends to be a golden to dark brown, sometimes with darker streaks. 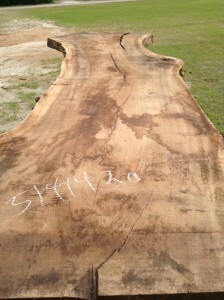 Sapwood is usually thin and yellow/white, clearly demarcated from the heartwood. Monkeypod is sometimes seem with highly figured curly or wild grain patterns. The grain is usually straight, but can also be interlocked or wavy. Texture is medium to coarse, with medium to large open pores and a moderate natural luster. Rated as durable to very durable regarding decay resistance, Monkeypod is also resistant to most insect attacks. Monkeypod is generally easy to work with both hand and machine tools, though any interlocked grain may result in fuzzy or torn grain during planing operations. Glues and finishes well. Often used for veneer, plywood, millwork/trim, carving, cabinetry, furniture, musical instruments (guitars and ukuleles), and other small specialty wood items.